Some friends and I have entertained ourselves by working up our own versions of the Cantigas de Amigo by Martin Codax. We started with a transcription by Chris Elmes. While much of that was very good, some of the transcription was troublesome, so we took a close look at the original manuscript. (ca. 1275, image from Wikimedia). We ended up making our own transcriptions, or heavily editing the ones we started with, for almost all of the pieces. Information from http://www.cantigasdesantamaria.com was very helpful in transcribing neumes and informative on pronunciation. Researching the Arabic influence on this music led us to http://www.maqamworld.com, an endlessly fascinating site for a Western trained musician to browse and learn a different approach. We are happy to share the scores we have come up with, invented second parts, indications of improvisation, and all. Links to highlights of our 2012. We’ve done this before, and liked it. So we’ll do it again! 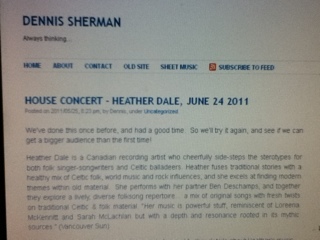 Visit http://www.HeatherDale.com for sound clips and further details about Heather’s music. Reservations required! House concerts have limited seating, we need to be sure we don’t overflow the living room! EDIT: Date Change! Originally planned for 2012-07-14, Heather’s touring schedule changed, and she will now be here 2012-07-20. I love my Kindle. I had a Kindle 2 until it died, and Amazon’s customer support was great about trying to fix it, and then giving me a good deal on a Kindle 3. Now I also have a Kindle Fire. And I use Kindle Reader Apps on Windows and iOS platforms. There are many free e-books available in Kindle format. Google will help find them. This post is about searching the Amazon Kindle Store to find temporarily free e-books. There are thousands. Many are junk by an incompetent writer that figured out how to self-publish via Amazon. Many are good, by a writer that hasn’t been “discovered” yet. I’ve been following a couple of blogs that regularly post information about the free books available. Now that I have several hundred books queued up, of unknown quality, I’m going to take a different approach. This page has some links to customized searches of the Amazon Kindle eBook Store. I hope they’ll lead to interesting items of reasonable quality. Feel free to copy the URLs and play with them yourself. Read, or at least skim, several reviews. If there are red flags raised, get something else. The searches below already encapsulate the rule “only look at things that are highly rated”. The Basic Search: Published last 30 days, 4 or 5 stars, not public domain, ordered lowest price first. All the other searches are refinements of The Basic Search, trying to get to material I might really be interested in more quickly. You can find other people’s techniques for this via Google. I recently took a combined business and vacation trip that lasted two weeks, and I took only a “rollaboard” carry on bag. The business trip included a need for dress and business casual clothes. This trip had an advantage over some hectic vacation trips in that I stayed in the same hotel for most of the two weeks I was gone. This let me find a laundry down the street, and have laundry done at the midpoint of the trip instead of hand washing in the hotel bathroom sink. Or paying exorbitant hotel laundry rates. The weather was also an advantage toward light packing, late summer on the Mediterranean is very temperate, and warm (and bulky) clothes weren’t necessary. I carry this in the top outside pocket of the rollaboard, where it is easy to pull out and put back for security inspection. This was the first time I’ve gone this long in a single small bag. Now that I’ve done it this will always be my goal. Posted on 2011/07/04, 8:06 am, by Dennis, under Music. I recently purchased some new-to-me instruments, an alto and tenor Renaissance shawm, made by John Hanchet. That leads to a need for a new instrument case, as what I’ve been carrying isn’t deep enough for the 5″ bell on the tenor. The biggest two considerations were enough depth to hold the instrument bells safely, but not too large a case to fit in the back of the car. ATA certification is a strong bonus characteristic, so I can fly with instruments in the cargo hold and not worry about them too much. I looked at rifle cases, shotgun cases, double bow and bow and rifle cases, keyboard cases, trombone cases, and some general purpose military shipping cases. What I ended up ordering is a case made as a 61 note keyboard case by SKB. I expect to have to do some interior customization to hold my instruments, but that shouldn’t be much of a problem for me. This case is a few inches shorter than my old instrument gun case, a couple inches wider, and the inch and a half deeper I need to hold the new instruments. And it has wheels! I remember reading a fair bit of Lovecraft when I was younger, and being captivated by it. I can’t tell at the moment if this is a particularly non-sterling example of his writing, or if I’ve just moved on. I abandoned listening to this halfway through the first chapter (of 6). It was putting me to sleep while driving, which is a really bad thing. The reader was doing quite a creditable job, but the prose style of endless descriptive sentences, with nary a dialog or character to be seen, was soporific. If you’re currently a fan of Lovecraft, you might want to give these free downloads a try. Otherwise, pass. This post is a test. It is only a test. If it were real there would be content here that might be meaningful to someone.